Today my journey brought me to the Starbucks on 33rd and 10th avenue. I love Hells Kitchen and adore Chelsea, but there is this 10-15 block cross-section between the two neighborhoods that I’ve concluded is one of the ugliest neighborhoods in Manhattan. It’s picked up the name Hellsea, and I couldn’t agree more. Not only is it covered in construction and jammed with traffic most hours of the day, but there is ultimately no real reason for one to venture into this part of the city unless your fleeing by way of the Lincoln Tunnel. It doesn’t look residential and the few restaurants I passed by failed to stand out. 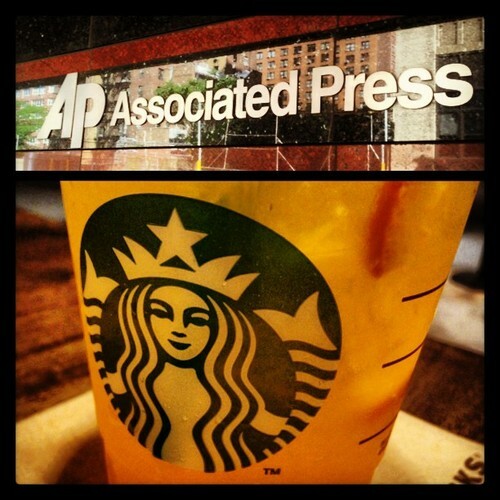 This Starbucks is actually located in the lobby of the Associated Press’s headquarters. While most lobby-oriented Starbucks are squashed and unimpressive, this one is actually a decent looking cafe. It has glass panels separating it from the entrance to the AP, and could just as easily be a solo-location. I arrived just in time to catch the 5pm mass-exodus from the offices of the AP. Although several caffeine deprived reporters dived in for a quick pick-me-up, the line never grew too long and most left, leaving the seats vacant. If I worked for the AP I fear half my salary would be drained at this Starbucks. The Decor… For a Starbucks located inside another building, this one really sets itself apart from the AP. It has dark concrete floors, wooden falls, and vintage hanging lights. The Crowd… A few people lingering but plenty of seats to go around. The Location… They don’t call this area Hellsea for no reason. Also, you really wouldn’t know this Starbucks was here if it weren’t for the Starbucks App. The Hours… Closes at 7pm each night and not open on weekends — obviously this Starbucks is a business oriented location. The Restroom… None in the Starbucks. Perhaps try sneaking into the AP? The new Valencia Orange Refresher… It’s definitely my favorite of the refresher drinks that Starbucks brought to the market sometime last year. This one is brand new and reminds me of of tang with an extra kick. It’s a little weird to be drinking a non-alcoholic beverage with an orange peel floating in it, but it tastes much better than I expected it would. The people of the AP are lucky to have this Starbucks on site.